Daughter of the National Leader of the ruling All Progressives Congress (APC) Chief Mrs. Folashade Tinubu-Ojo, led over hundred market men and women under the auspices of Nigeria Commodity Market men and women to protest what they described as a use and dump treatment meted on the market by the party. Folashade Tinubu-Ojo stormed the National Secretariat of the APC in Abuja on Thursday with her members who said they are not happy with the government of the day that is not carrying them along as it should be. She said “I am here this afternoon to represent market women and men of Nigeria. There has been agitation, not even agitation or allegation, the people believed that the government of the day is not carrying them along as it should be, that they worked round the clock for the party during the electioneering campaign, but after the inauguration most of us are not carried along. “We only hear on the news that the First Lady is doing a programme this and that and we just see it on the news and they wouldn’t allow me be, all the complain come to my table morning and night and I say okay enough is enough. When asked if she came with her members to protest against the APC she said ” is not please don’t put that word in my mouth, is not a protest, is both ways anyway, is a courtesy call to the party leaders, the national party leaders and also to bear out our minds to speak the mind of the traders, that the real people in the market should be carried along who I represent. Responding to the question on the position of her father in the APC and she has stormed the party with her aggrieved members does not look good she said “No, Traders are not partisan, we are not politicians, we are not mobilizing against the party, don’t get it wrong all we are crying for, because I am the daughter of the National leader doesn’t mean that I must not represent my people well. 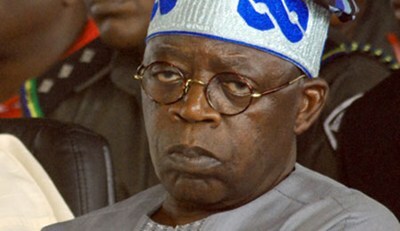 The younger Tinubu claimed that she is the President General of the Nigeria Market Men and Women. ” I am already no one is contesting that with me, no I am already a leader, that is the position I hold when Mr. President was in Lagos when they organized meet the government or whatever that Mr. President wanting to meet the Nigerian women, I organized every state, every state were present in that meeting, so no one is contesting that with me. She said an impostor in FCT woman leader is organising another market association and named it association or organised market people in Abuja, she added that “most of these people are PDP people they are nowhere to be found when we are working for the party day and night, so now our people are not happy because they need to benefit from where they believe they have the right to and all we need, all we are crying for is for the government to give them sense of belonging and carry them along properly.